What is your writing background? Have you always written alongside acting? I started out doing character comedy on the stand up and cabaret circuit. Over the first couple of years I wrote material and cobbled together a five-minute open spot, then ten minutes and eventually the tried and tested twenty minute routine needed to get proper paid gigs in the clubs. Soon after I’d managed that I got a regular compère spot at a cabaret club in Deptford. It was quite a popular club for a few years and attracted a good audience. But among them were a lot of regulars who came every Sunday so I was forced to come up with new material every week. I have always had little bits and pieces of writing on the go. There is a shelf of notebooks in my office full of half thought out ideas stretching back years. They are great to dip into for inspiration and sometimes I’ll use a bit of dialogue that I originally scribbled down a decade earlier. About the only times I’ve been able to see a writing project through to completion have been when deadlines are involved. I would love to be able to take my time privately writing a film script or book and then hand it over finished to everyone’s surprise and delight but I’m afraid I’m that clichéd writer who leaves it until the last minute and then asks for a few weeks’ extension. Do you think being an actor and a stand-up comedian helps with writing, particularly convincing dialogue? 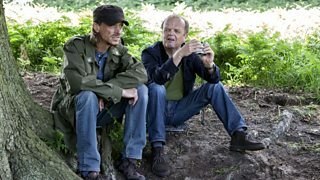 With Detectorists I know that I really enjoyed, and therefore found relatively easy, writing the characters, dialogue and jokes. This I’m sure comes from having been a performer for the last twenty years. Most of Detectorists was written standing up. I’d put my laptop on a kitchen counter and pace around acting out the scenes, typing as I went. Where I struggled was with structure and seeing the series as a whole. At the beginning I was determined to prove (to myself more than others) that I could write it alone, but it was only when I started discussing the scripts, first with my friend, the director Peter Howitt in Vancouver, and later with our producer Adam Tandy, that the scripts started taking a proper shape. I had been piling ideas in left right and centre and was too precious to get rid of anything I was fond of. Adam helped me single out what was the essence of the show and what needed to be stripped back in order to achieve that. 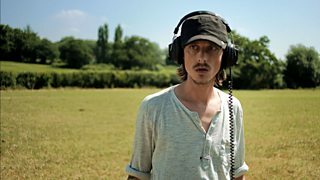 What was the genesis of the idea for Detectorists? There was a movie a few years back called Grow Your Own about gardeners on an allotment site. That was a beautiful film as was Ben Wheatley’s Sightseers. I love people and their hobbies as subject matter, the strange obsessions with which people fill their spare time. Finding treasure has fascinated me since childhood. I longed for a metal detector as a kid, never got one but I still found fossils and a clay pipe and once, on holiday in Africa, a spearhead and some old bushman cave paintings. There was an episode of Time Team a few years back that featured a couple of metal detectorists. They were very protective of their site and the crew had to be blindfolded so they couldn’t find their way back. They seemed very defensive about their hobby and yet very knowledgeable about archaeology and I thought it was a subject worth looking into. Can you describe the development process? Are there times when you have to cede control of your ideas to others? How does this feel? The development process and getting Detectorists to the screen was an unusually smooth process. I already had two sample scripts and Toby Jones potentially interested when I went to see Shane Allen at the BBC. He was so enthusiastic from the start, understood exactly what I wanted to do, and didn’t seem to see any reason why we shouldn’t do it. Shane gave us the go-ahead to make a ten-minute taster tape which we shot on the hottest day of 2013, Wimbledon final day when Andy Murray won. Off the back of that short pilot (basically the first two scenes from episode 1) I was commissioned to write six half-hour episodes. Shane and Kristian Smith at the BBC have overseen the whole production but have very rarely interrupted the process or tried to change anything. They seemed to trust what we were doing and largely left us to it. Did you write any of the roles with specific actors in mind? From the moment I pitched the idea to Toby Jones in early 2013 I could think of nobody else playing the part of Lance and wrote the whole series with him in mind. Likewise the parts of Becky and Maggie were written specifically for Rachael Stirling and Lucy Benjamin. Other parts I had various people in mind for and ended up casting a lot of my friends. It makes sense when you know somebody’s work and you know they are right for the part. Detectorists has a particular understated feeling that feels specifically British – is this a type of comedy you are particularly drawn to or does it derive from your own experience? I like a lot of different types of comedy but I think I just missed having a slower-paced, understated show that wasn’t out to test any boundaries or be controversial, a comedy that didn’t need a gag every eight seconds but had space to breath. 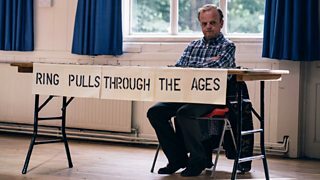 Like the great comedies of Esmonde and Larbey: The Good Life & Ever Decreasing Circles, I wanted Detectorists to be uncynical. Is this the first time you have written a full series and if so how did that differ from your previous writing? Have you already thought about Series 2 and how that might develop? This is the first time I have written a full series. I found it a very fluid process and quite liberating compared to the two children’s books I have written. At some point, with a book, you need to sign off and say ‘that’s it, it’s finished’ at which point it is printed in black and white, whereas with a script it can be constantly changing and being amended right up to the day of filming. We have been commissioned to make six more episodes which is a very exciting prospect. My head has been in the world of metal detecting for 18 months now and I’m still in the zone so I’ll start writing immediately. It will be important to identify which elements need to remain, what are the key ingredients of the series that make it what it is? Part of what people seemed to like was the stillness of the series and the fact that not very much happened. It would be a mistake to shake up that formula too much but, at the same time, new characters and storylines need to be introduced to make the second series different from the first.